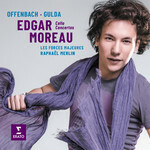 Edgar Moreau performs two cello concertos which bravely and wittily challenge convention. Offenbach's ambitious Grand Concerto in G major culminates in military fireworks, while Friedrich Gulda's Concerto for Cello, Wind Orchestra and Band - written 130 years later - is a dazzling stylistic kaleidoscope. Moreau is joined by conductor Raphaël Merlin and the dynamic orchestral collective Les Forces Majeures.